Welcome to the third adventure in the ZEITGEIST adventure path! In the wake of a villain's defeat, his accomplices flee into the seedy underbelly of Flint. The party tracks down an arcanoscientist selling illegal arms and magic developed in labs owned by the fallen villain, and discovers a curious collection of ancient artifacts. These primitive weapons contain powerful spells capable of conjuring alien monsters never seen in modern times. To unearth why shadowy forces are collecting these relics, the partytravels into the High Bayou, lair of the dread fey titan called the Voice of Rot. There, beneath an ancient ziggurat, the party finds the remains of a doomed archaeological expedition, and learns that a powerful alien entity has escaped its ancient prison and entered this world. The party has tugged into view one thread of the conspiracy, but to reach its heart and see how deep the threat goes, they're going to have to dig. An adventure for enterprising heroes of 4th-5th level. The third part of En Publishing's steampunk-AP is 99 pages long, 1 page front cover, 1 page editorial, 1 page ToC, 1 page SRD, 1 page back cover, leaving us with 94 pages of content, so let's check this out! After the rather trademark smart and complex narrative of Zeitgeist has been expanded and the adventure sketched (which includes a new form of madness and a feat to benefit slightly from insane clarities) we'll return to the matter at hand. The agents of the RHC have recently achieved a stunning victory against Macbannin, only to be stumped by their boss's boss, lady inspectress Margaret Saxby, who subsequently took over the investigation. in the rainy autumn months, though, the constablers will still have something to do. After all, the Kaybeau Arms and Technology Expedition is going into full swing: Modeled slightly after the World Exhibit, the PCs are commanded to guard the peace there in a village of tents full of experimentational weaponry -what could go wrong? After a short briefing by Sara Lockheart, the PCs will have opportunity to see some prototypes (and even help fine-tune some, engage in philosophical debate with the dwarf Kvarti Gobatiy and generally enjoy themselves - until the incident happens - not via an exploding prototype, but via the incursion of alien, nightmarish creatures! What could have been a mishap of magic turns weirder yet, as the creatures don't just disappear. If the PCs manage to save Simon Langfield, the unwitting arcanist who got these creatures here by using his staff of the ancients, they'll have a massive mystery at their hands. Of course, first it's time for the constabulary to confiscate bodies and items and Martial Scientist-PCs will also have a background-related benefit waiting from what happens here. The investigation of the fair should prove interesting, as a gang of thieving street urchins and the family complicates the investigations - yet another way for the PCs to get on the good side of notorious Morgan Cippiano, though. If they are smart, the PCs may well determine the origin of the illegal magic staff that caused the mishap and contact the responsible seller, posing as interested buyers. Hence, they are off to the Lanternwood Subrail Station, where they meet up with Kaja Stewart. If they think the fence helpless, they'll soon learn otherwise, for the woman has not come unprepared: Multiple walking turret constructs as well as her eidolon (she's a summoner) as well as her refreshingly smart use of the terrain should make this a challenging encounter indeed. While an interrogation of her might yield results, the conspiracy will move on to kill her - with a surprisingly apt plan, nonetheless. Also, her death is not required and if the PCs make the connection, she can describe a tiefling surprisingly like Caius Bergeron in the context of the McBannin-case. With her dead or not knowing more, the investigation, for now, is stumped and in a dead-end, which the module uses for a foreshadowing of module #5, in the form of a dead body and a mangled golem, mysteriously torn to shreds . Reactivating the golem, who now houses the mind of a rogue Obscurati, will be a project that spans multiple modules but eventually yield success. But back to the weird magical items: Seeing that they seem old, the logical step to check for their origins would be the Pardwright University of Natural History's Professor Hans Weber. The professor heard rumors about a recently unearthed ziggurat in the High Bayou and that Dr. Xambria Meredith led an expedition there. Being the only survivor of the ill-fated trip, the woman has been slightly addled by the now blurred ordeal. The constables may make ample conversation with her, though, and thus fill in gaps in their knowledge of the ancient secrets. Now also rather interesting: It was Caius Bergeron who financed the expedition of Dr. Xambria and while, for now, they can't really nail the elusive noble down - for now. With all resources exhausted in town and work slowing to a crawl/busy-work at best, it is time for the PCs to leave Risur behind for the city of Bole via train and from there to the village of Agate and from there to the High Bayou's creepy swamps. (Also nice: If the PCs are versed in folklore and offer sacrifices to the sleeping fey titan, they can avoid fighting the native creatures of the bayou - great to award immersion and smart thinking.) The ziggurat's otherworldy aura promptly starts to erode the sanity of the PCs and in a break from investigations, they have a dungeon to explore at their hands - one that makes the spirit-seers see bad omens and features fun components like hallucinations and dead bodies! Have I mentioned the notes of the lost expedition, the traps galore, the actually intelligent puzzle based on planetary correspondences and teamwork and weird aberrations? Yeah. They're there. Better yet, the obscurati have not been idle and have added their own trickery to the already formidable dungeon. If the players persist, though, they may in a vision witness the sealing of the planet Apet (from which the weird creatures at the fair hailed) and the dysfunctional portal to the place that was once sealed by the confiscated staff and the legendary axis seal. Once the PCs have loitered enough, things get UGLY: A flood of poison spreads throughout the Ziggurat, forcing the PCs to make a run for it. Worse yet, EACH and every mummy they have seen animates, making the escape a running fight through the step-pyramid's corridors. Upon their escape, the Voice of Rot, the fabled fey-titan, demands sacrifice: One thing, sentient, has escaped and the titan wants it dead and rotting - and the PCs better oblige. the detect Planar Energy-spell here is a great help, in fact, it is throughout the module: A concise and interesting list of clues helps DMs run the investigation of this particular lead. Upon their return to Risur, the PCs hence have a fey titan to appease and find the suspect - but other news also ask for their attention. Their main suspect, Caius Bergeron, has been murdered, in a locked room. Witnesses report a woman fitting Xambria's description having a lively discussion with Caius as well as a ring that could be the first clue the PCs have for the Obscurati's means of identifying one another - or get into the deep end. More pressing is a map with coordinates... And celebrity bard Rock Rackus, who also shows traces of Apet energy and is currently languishing in jail. The man with the apt name is something of a rockstar who claims to have visited the unseen court of the fey (on the moon) and also happens to be a specialist in teleportation magic. He also has this particular scroll he misplaced that may lead to quite a bit of interesting treasure and information (in module 12) - if only the PCs could get these pesky charges dropped? Better yet, dockers are looking up to the man, though he is just riding the wave right now and after his own gain - if the PCs are convincing, they may stir him to become, quite literally, a better man and thus influence the future modules as well. The return to Flint with their captives will prove the mettle of your PCs, especially their paranoia: The mastermind of the latter troubles makes its move if the PCs don't use their wits: A creature called Sijhen, a spy and scout from the planet of Apet that has lain dormant in Xambria's consciousness - rising from the body when needed and forcing her/modifying memory it tries to assassinate PCs, crew, anything alive on the ships, really and the creature also has an evil array of summoned monsters attack. Probably , the dread creature beats the PCs back to flint, with the golden icon of Apet, enacting its masterplan, thankfully befitting of a creature of its intellect. Upon their return to Flint, they'll realize that the strange madness from the ziggurat has spread to Flint and by now, the PCs hopefully can connect the items of the ancients with the madness. The Museum of Natural History host a grand gala and the PCs may socialize - until Xambria/Sijhen make their move and assault with a contingent of deadly creatures from Apet - if the PCs manage to defeat the duo, Xambria seems to wrestle free of Sijhen's influence and realize her mutated, eye-sporting arm, surrendering. Xambria hopefully can retain control long enough and thus, the PCs get her back to HQ while she can stave off the influence of Sijhen. Unfortunately, this is also part of Sijhen's plan - it contacted the Obscurati, threatening to expose them: And indeed, Xambria reveals the existence of the conspiracy to the PCs, connecting Mcbannin and Bergeron, adding the information that Caius had the plan "to ride the train" (to be featured in adventure #4). Worse, She exposes Saxby as a member of the Obscurati before being taken over by Sijhen again and the creature floods the RHC headquarters with planar energy before phasing through the ceiling. The whole headquarter turns first translucent, then transparent and the game is on: Members of the RHC become mad due to the planar energy-influx and not only is Sijhen escaping, the PCs will have to rally the maddened RHC operatives, defeat the obscurati kill squad sent to dispatch them (which unprofessionally mentions notorious crimeboss Lorcan Kell) and catch Lady Saxby, who is guarded by fellow RHC-officers unaware of her duplicity and trying to make a run for it. Oh, and Sijhen is opening a gate in the subterranean railway-tunnel, trying to escape to its home planet. Worse, Sijhen is conjuring a truly interesting unique vast creature the PCs will have to defeat and worse, Xambria is doomed to die unless spirit mediums intervene - alternatively, her consciousness may end up in one of the PC's bodies. 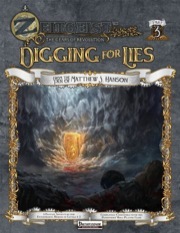 The first appendix includes multiple optional encounters, like an audit with Lord Viscount Inspector Nigel Price-Hill (husband of Saxby who does her best to discredit them), Lorcan trying to frame a murder on the PCs for taking down Kaja's smuggling operation and a radical Vekeshi plot of a less than smart being wanting to assassinate Rock Rackus - trying to recruit a PC for the job. The pdf also provides stats for the new creatures, new magical items (including the experimental steam suit), the boon of sharing Xambria's consciousness, dramatis personae, 3 beautiful hand-outs, 5 pages of quick naval combat rules, and 14 pages of beautiful maps. Editing and formatting are top-notch, I didn't notice any glitches, which is quite a feat. Layout adheres to the 2-column standard and is full-color and beautiful. The original artworks are GLORIOUS and supplemented with stock-art here and there. Cartography deserves a special mention, since the maps are beautiful indeed. It should be noted that the pdf comes with layers that enable you to print-it out without draining your printer as much - though there is a problem pet-peeve for me: The maps lack player-friendly versions (with one exception) and are studded with numbers. While I don't mind regarding the RHC-headquarters, the other locales should also come with player-friendly versions. Just downloaded the PDF, and it seems that the front cover is missing. The file starts with page i. The first two adventures did have front covers. I've sent an email letting the publisher know about the issue—thanks for pointing it out! We're having touble with the file uploader here (and the large file size) - I'm emailing the hi-res version with cover to Liz, who says she can upload it manually from their end. Sorry about that! So, has anyone checked this one out? How does it play? Sorry for the late reply, but there are several GMs running the campaign and posting about their experiences over at EN World. Redbadge is running it in 4e - http://www.enworld.org/forum/en-publishing/313654-redbadges-campaign-there- will-spoilers-3.html#post5884810 - so this can give you insight into the plot, if not the mechanics. I don't know that anyone running it in Pathfinder has gotten to adventure 3 yet, or at least hasn't posted about it. We're about to release adventure 5 in a couple weeks, though, which was written by Thurston Hillman. He's our Pathfinder conversion guy, and for #5 I'll actually be doing the conversion to 4e, instead of our normal route of "write in 4e, convert to Pathfinder." Oh, but there is this GM who posted about running adventure 4 - Always on Time - in PF. He never posted about the earlier adventures, but I thought you might be interested. And reviewed here, on DTRPG, sent to GMS magazine, submitted to Nerdtrek and posted about it on Lou Agresta's RPGaggression. Cheers!